^ Edwige Fenech. Rotten Tomatoes. [2013-07-18]. ^ INTERVISTA A EDWIGE FENECH 互联网档案馆的存檔，存档日期2014-10-26. ^ Edwige Fenech. cultsirens.com. [2013-07-18]. 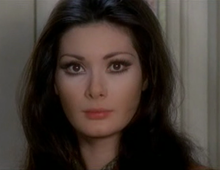 ^ Edwige Fenech, the giallo queen. rarecultcinema.com. [2011-10-23]. （原始内容存档于2012-03-25）.